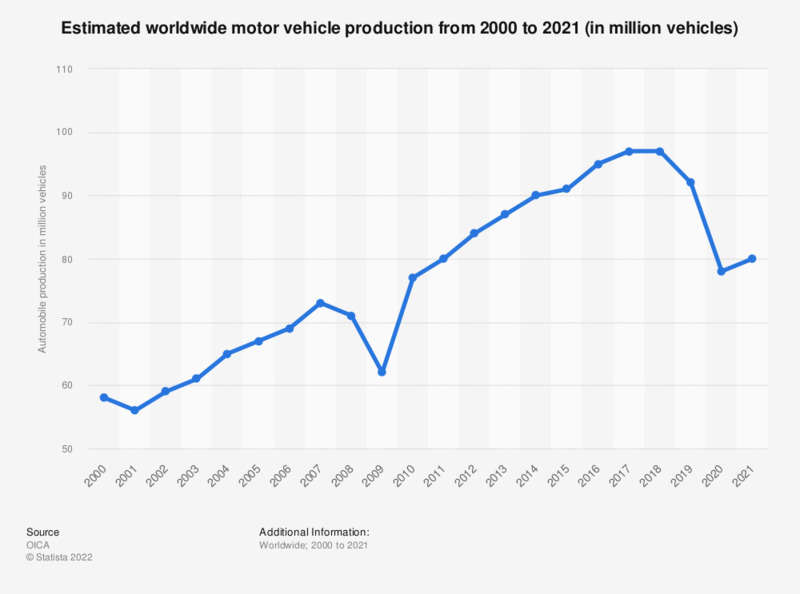 This statistic represents worldwide automobile production from 2000 to 2018. In 2018, some 70.5 million cars were produced worldwide. This figure translates into a decline of around 1.2 percent, compared with the previous year. China, Japan, and Germany were the largest producers of passenger vehicles in 2018. In 2018, the international automotive industry produced an estimated 70.5 million passenger cars. Worldwide, passenger car sales are expected to continue to grow to about 80 million units in 2019. Car sales started falling dramatically during the 2008-2009 economic crisis. Today, the volume of automobiles sold is back to pre-crisis levels thanks to increased demand, especially from Asian markets. China is ranked as the largest passenger car manufacturer in the world, having produced more than 23.7 million cars in 2018, and accounting for almost one third of the world’s passenger vehicle production. One of China’s largest car manufacturing company is the joint venture between General Motors and SAIC Motor Corporation Limited, known as Shanghai General Motors Company Ltd or simply Shanghai GM. GM produces and sells passenger vehicles under the Chevrolet and Cadillac brands, among others. Aside from manufacturing cars, the company also produces engines and transmission systems. Shanghai GM’s domestic sales amounted to a little over 1.7 million units in 2015. Over the past decades, China has emerged as one of the main growth markets for players in the global automobile industry, with car sales amounting to 23.7 million vehicles in 2018. The numbers for commercial vehicles have been added up. The figures for 2000 through 2016 were taken from previous editions of the publication. Audi, BMW, JLR, Mercedes, Scania and Daimler Trucks data not reported for India, according to the source. New Zealand: Do you have access to a car?